You will have such a fantastic time at your Baby Shower with some of these Party Supplies. Create an awesome theme that will brighten up the room for everyone that attends. With so many different options of decorations and favors available, you will have a great time shopping and getting ready for an awesome baby shower! When you are planning one of these events, there are a lot of things to think about. If you know whether the expectant mother is having a baby girl or boy, you can set a certain theme for the entire gathering that more appropriate. Even if you are not sure, we have plenty of supplies for baby showers that will help you get your party decorated to the fullest extent. The way you want it to go is totally up to you. All we can do is offer you as many awesome products as humanly possible so you can pick out as many of them as you want to create the exact atmosphere that you want! There are a ton of different things that you can do with our party supplies for baby showers. Use balloons, ribbons and tablecloths to create a great color scheme. Get all sorts of different favors and giveaways that you can hand out to all of your guests to remember what a fun time they had. Even get a personalized doormat to welcome everyone as they arrive. The opportunities are truly endless with our awesome inventory. We hope you are able to find a bunch of items that you like and will be able to set the event up in the perfect manner. 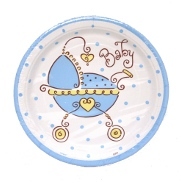 Have fun shopping through our baby shower party supplies and you will be able to enjoy the gathering that much more. We wish the best for you and your child!